I could leave this wordless. I really could. My little boy has pretty much always hated kisses. Can you tell?? He wiped my kisses off. And Hugs? Yeah, those too. Hated. I could talk him into a ‘boy’ hug. Where I would grab his shoulders and get close (but not too close) and basically sqeeze him while growling at him.. He LOVED those kind of hugs. But in the last two weeks? WTHeck? Who stole my little boy? 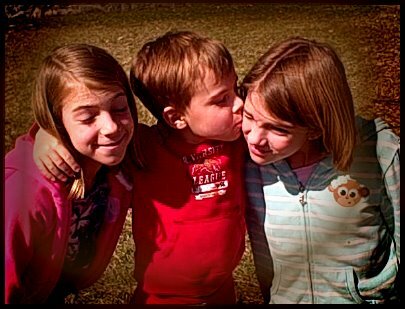 He kisses the sisters and knows everyone will laugh. And he’s taken to asking me to bend down for a secret… and then sneaking in a sloppy, slurpy KISS instead! I of course pretend not to like it and then have to chase him down for some serious tickle torture… which he REALLY hates…. He’s growing up… will he still want to sneak in a secret kiss? You are currently browsing the archives for the little boy kisses category.